Looking back 30 years: Kedar and Nirmala Misani from Zurich, both disciples of Sri Chinmoy managed a health food directly heated wood-oven bakery named “Ecstasy-Sky” in Zurich from 1982 to 1995. Daily three types of organic bread and several sweets were produced and sold in their own shop as well as in about 20 other local and health food shops in and around Zurich. Filmed by kedarvideo, Switzerland. This is an excerpt of an old 16mm film on the life of Sri Chinmoy, showing him walking in the countryside, meditating on a meadow and demonstrating spiritual qualities such as light, delight and power. In July of 2006 Sri Chinmoy visited Kamakura, Japan, for one week and went many times to pay tribute to the DAIBUTSU, the big Buddha sculpture. Here the final improvisation on the synthesizer at the end of an open-air concert in front of the Buddha. Filmed by kedarvideo, Switzerland. 3100 mile runner Stutisheel Oleg Lebedev speaks about his challenges at the biggest race in New York, his first participation in the Zurich Lake Marathon Swim, as well as the importance of meditation and nutrition. This is the 40th edition of the interview series LIFE Voices. Produced by kedarvideo, Switzerland. 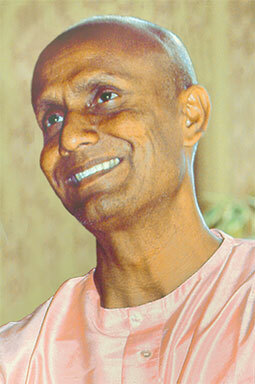 In Geneva, several hundred paintings by Sri Chinmoy have been exhibited at the Palais des Nations, United Nations Office. The event was sponsored by the Permanent Mission of Bangladesh in Geneva, with support from the Cultural Diplomacy and Outreach Section of the UN Office at Geneva, in collaboration with the Jharna-Kala Art Foundation. The exhibit contains several distinct genre of paintings. These include a series of Peace-Bird drawings, originally exhibited at the Carrousel du Louvre, Paris, in 2006. Another series of 9”x12” acrylic paintings were first shown at an exhibition at St. Petersburg State University, Russia, in 2004. Stutisheel Oleg Lebedev finished the Zurich Lake Marathon in 9:53:27 h and became the first Ukrainian to finish the swim. Sri Chinmoy meditates during a peace concert in Stockholm, October 1990. Filmed by kedarvideo, Switzerland. Californian pedestrienne Yolanda Holder became a legend, walking the entire 3100 miles of this year’s 3100 mile race of Queens, NY, and finishing yesterday fifth overall in 51 days+17:00:13. She became the oldest woman to finish the 3100 mile race, and only the second American woman to complete this difficult race. She is the first pure walker to attempt the distance. She has now set many age-group women’s best marks for daily totals, as well as miles and kms. On Sunday, August 6, 2017, another sitting sculpture of Sri Chinmoy has been inaugurated in Budapest. Recorded during a peace concert in Berlin in 1990 by kedarvideo, Switzerland.